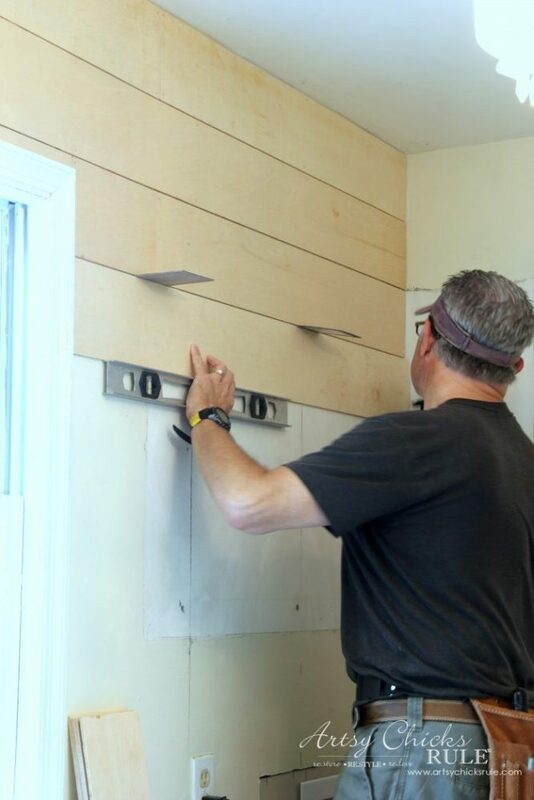 Installing shiplap in your home shouldn’t be exhaustive OR expensive! 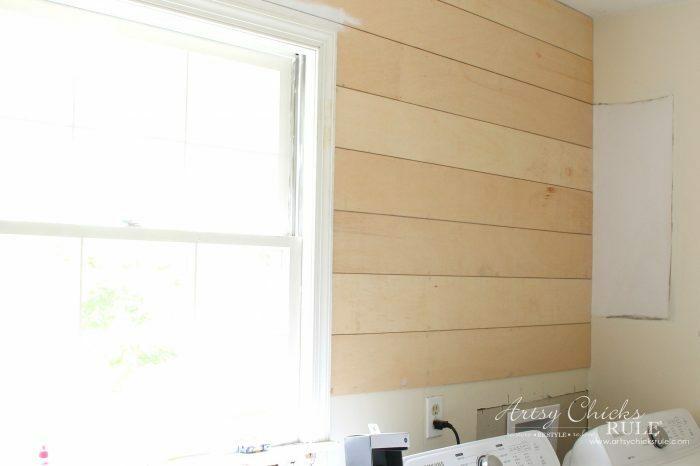 Learn how we did our DIY faux shiplap, the easy (and inexpensive) way! 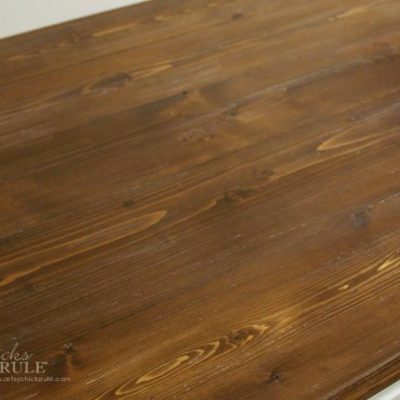 Today I’m back with the DIY Faux Shiplap tutorial. 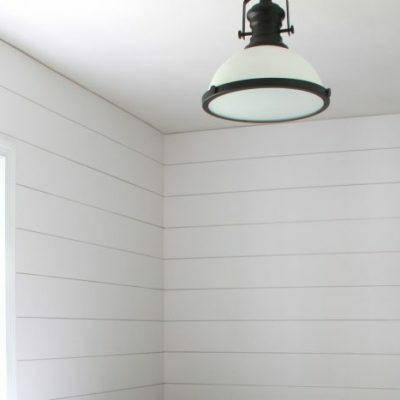 The DIY faux shiplap is a lot cheaper and pretty easy to install. Lots of “behind the scenes” in live time. Okay, let me start out by saying that you can get The Home Depot or Lowe’s to rip these down for you. That is what we did to get it done quickly. Unfortunately the person cutting tried to cut a bunch of boards at one time which left us with different sized boards, uneven cuts and really rough edges. It was such a mess that they ended up giving us 50% off the total cost. Thankfully we had added in quite a bit extra for the job because we had to sift through the pieces and discard any that were not cut straight or weren’t the right size. If they had cut one at a time (or even only 2 or 3 at a time) we wouldn’t have run into this problem. But like I said, the person cutting thought they’d get it done quickly and apparently was trying to cut 5 at a time! We came back over and saw this and got someone else to cut the rest. Anyway, just be aware of this if you go this route. For the size, we decided on 6 inches. I’ve seen where people do larger than this but 6 inches seemed perfect for the scale of our room. Since the boards were rough cut, we did have to sand the edges before installing. And you may notice that paint line above. I had originally thought since the walls were light to begin with that I wouldn’t need to paint first. 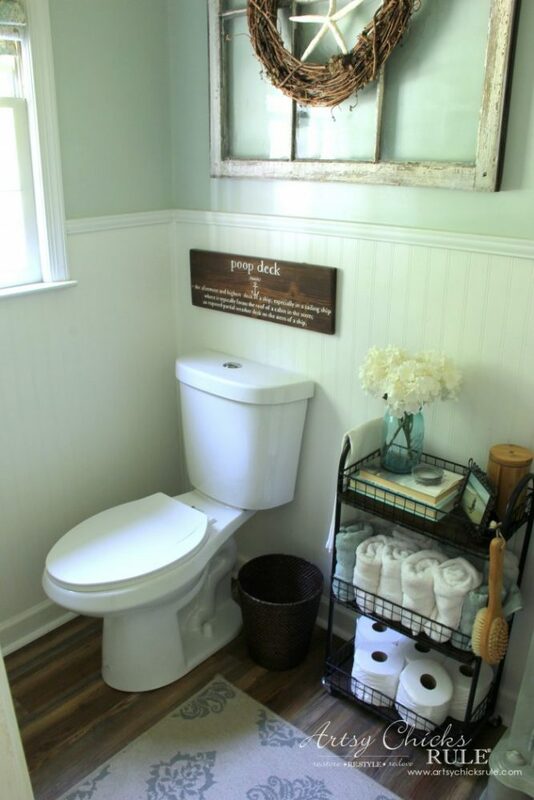 I should have painted the wall the same color I was painting the shiplap beforehand. I also should have painted the inside edges beforehand as well. We got about halfway through and decided to paint the walls and edges for the entire rest of the job. 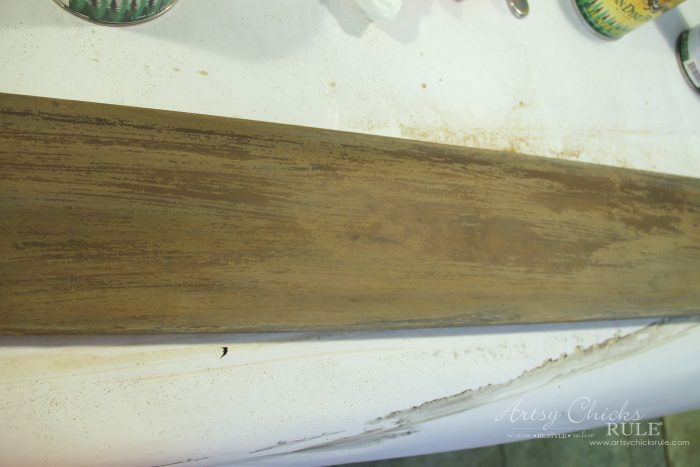 I went back and painted the walls everywhere there’d be a gap…..
….and as you can see, the edges of all the boards too. Trust me on this. 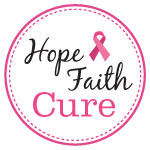 Take the time to do this beforehand. It will save you a lot of work. 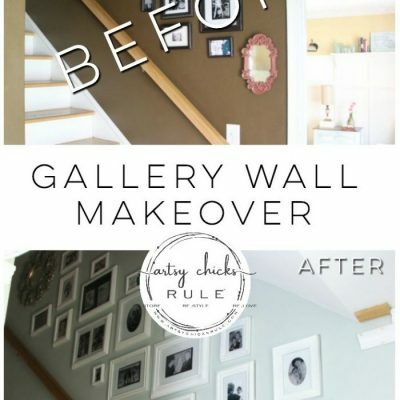 You’ll want to go around the walls with a stud finder and mark where the studs are. 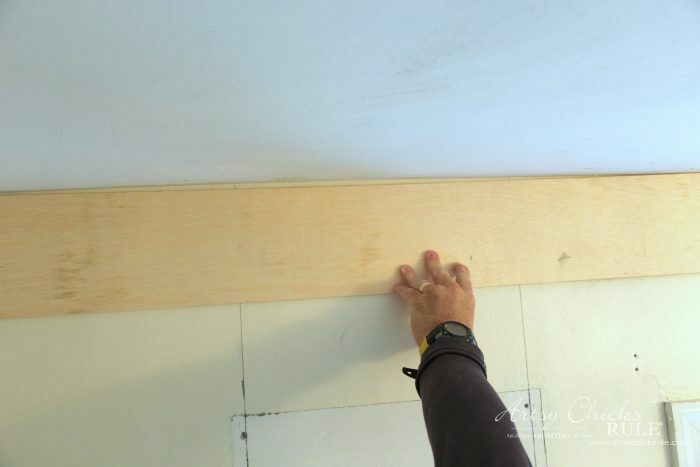 When nailing the boards up be sure to nail into the studs, whenever possible. 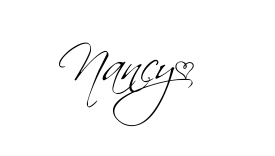 Okay, for the gaps/spacing between pieces. I’ve seen people use nickels or pennies and even the traditional spacers. But in the end we used these…..
…and a level of course. They are flooring samples!! Haha! Yep! And they were the perfect size for the gap plus they stayed in place pretty well. We used the brad nailer to nail them into place. We didn’t use any kind of glue behind them because we felt that was unnecessary. You may remember this big ole gap from this post. I hadn’t planned to add any extra trim to the top but once we saw how uneven the ceiling was we knew we would have to. 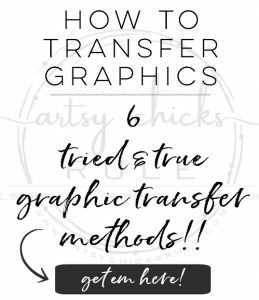 If yours fits tightly to the top I’d say you could skip this next step. This is the same exact spot you see above all finished. 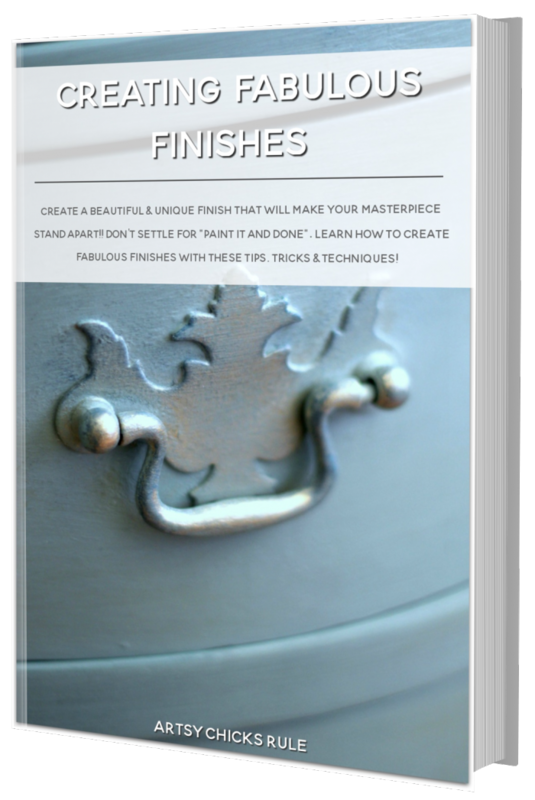 We used the casing all the way around to hide any imperfections and give a finished look. Much better than the unsightly gaps all around. Gotta love an older home and unevenness!! 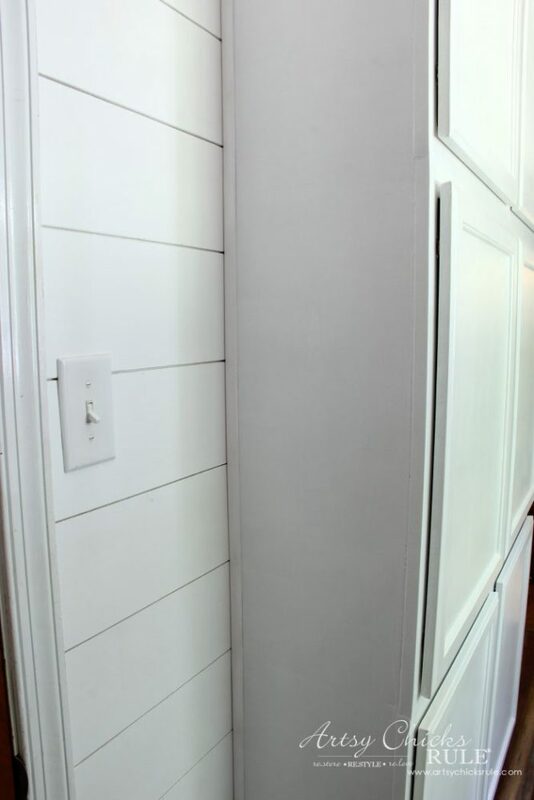 We also went back in and added these little baby DIY faux shiplap pieces in this gap here…..
We didn’t have these or the trim done for the big reveal. But I’m loving it all completed now. We also used the casing trim on the sides of the floor to ceiling wall cabinets where there was a gap. For reference the paint color we used on the walls is by Behr and called Nano White. It is THE perfect white, in my opinion, of course. 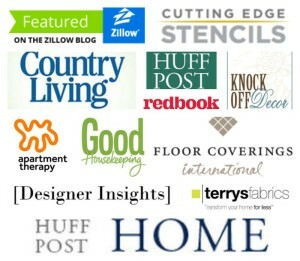 And caulk…..caulk is your very best friend here! 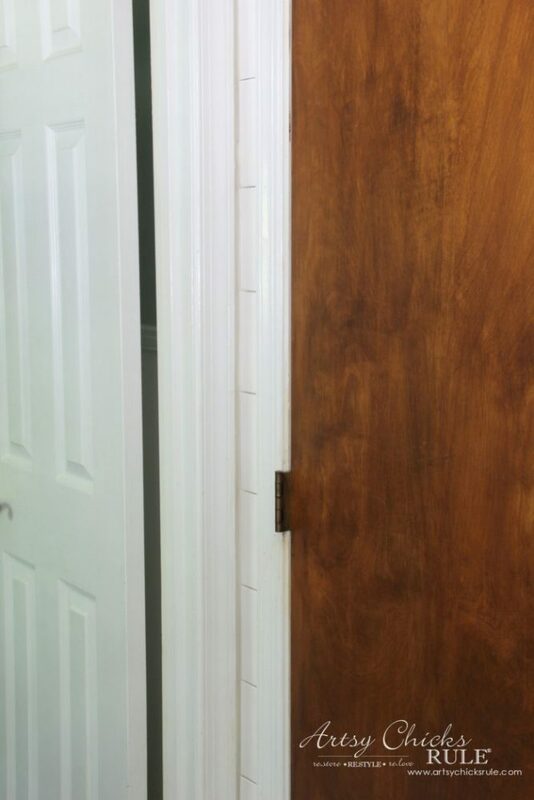 I LOVE seamless and once everything is up, go around and caulk all the ends next to the wall, door trims, corners, etc. Make it seamless and lovely. I hate caulking but I love how everything looks once I do. For the brad nail holes I used regular wood filler. It truly was not a hard job at all. BUT it was tedious. I can not tell a lie. It was a tedious job but so very doable. Do we want to do it again anytime soon? Nope! But guess what, we are. 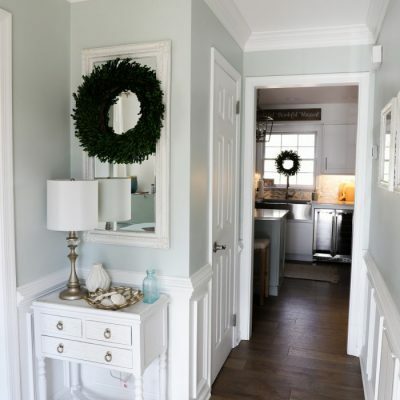 We’ll be adding shiplap in the bathroom area of our Master Bath/Closet Makeover. 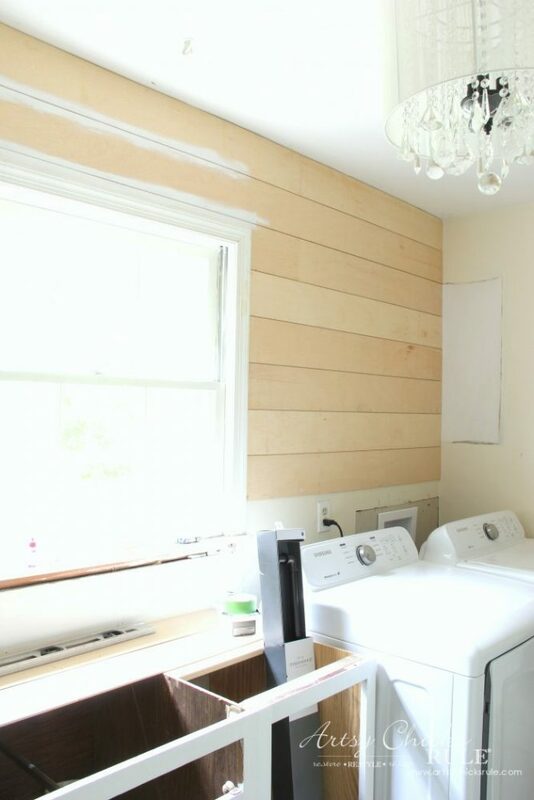 Which we are actually getting back to now that the Coastal Laundry Makeover is complete. I told my sweet hubby that we need to do it like we did that one, in 5 weeks!!! Well, we will definitely keep y’all updated here as we go on that project too…so stay tuned for that. Oh! I almost forgot, I wanted to share our little guest bath all finished too. It also got that awesome new flooring that the laundry got….plus we got rid of the long, forever and a day, did I say long, flushing toilet! Yay! But I’m so loving the flooring in here. SO much better than what we had in here before. 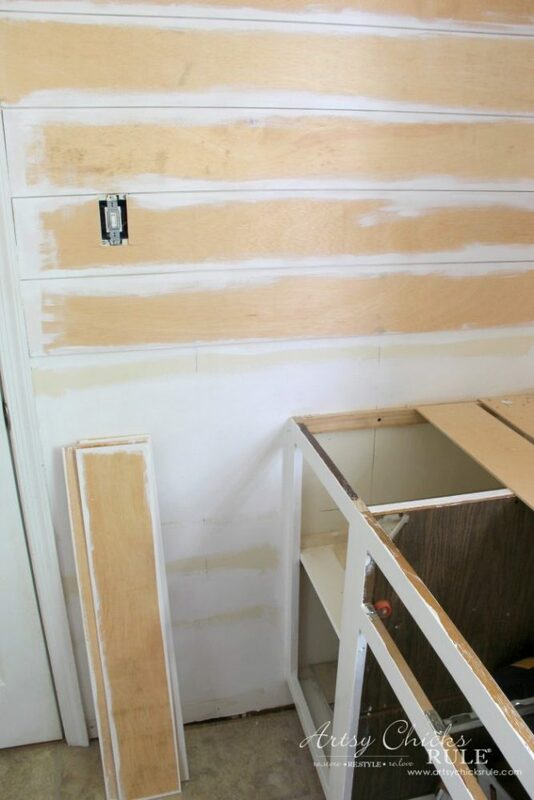 You can see all the makeover details of the guest bath (and the old flooring), here. 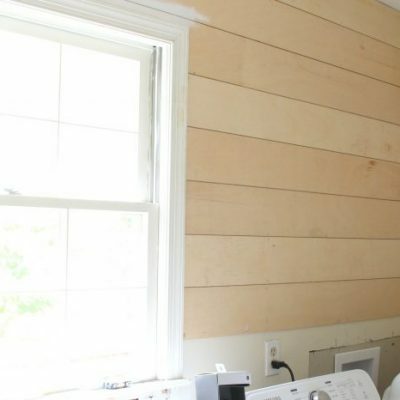 So glad we are finally, for real this time, done with the Coastal Laundry makeover and am just loving our DIY faux shiplap. It has made a world of difference in this room. I hope you all have a wonderful weekend! Can’t believe it’s already mid July, can you? 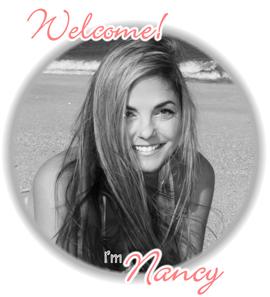 I’ll see you back here next week with a fun sign I’m working on! Nicely done! It’s all beautiful. Thanks for all the helpful and time saving tips. So often I dive into a project and realize I “coulda shoulda” done something earlier or different. It all works out but so nice to keep the momentum rolling and be efficient as possible. Stunning! 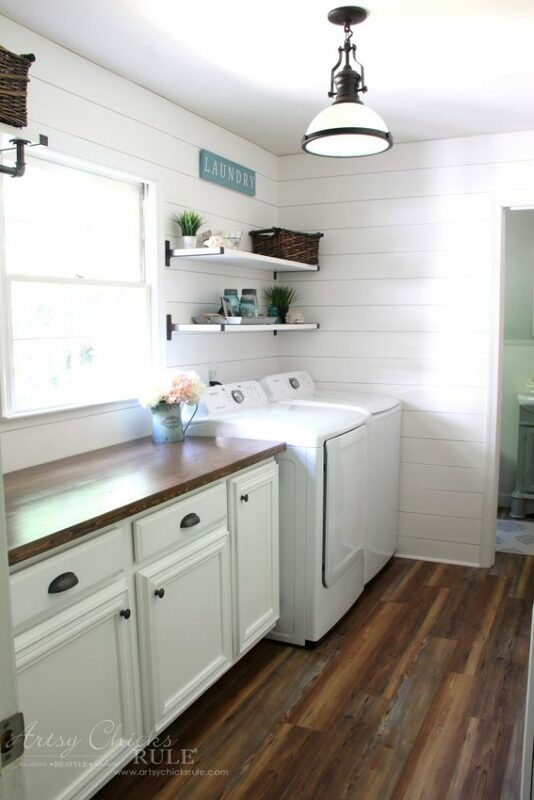 i so love the look of shiplap and your laundry room is spectacular. What a beauty!! 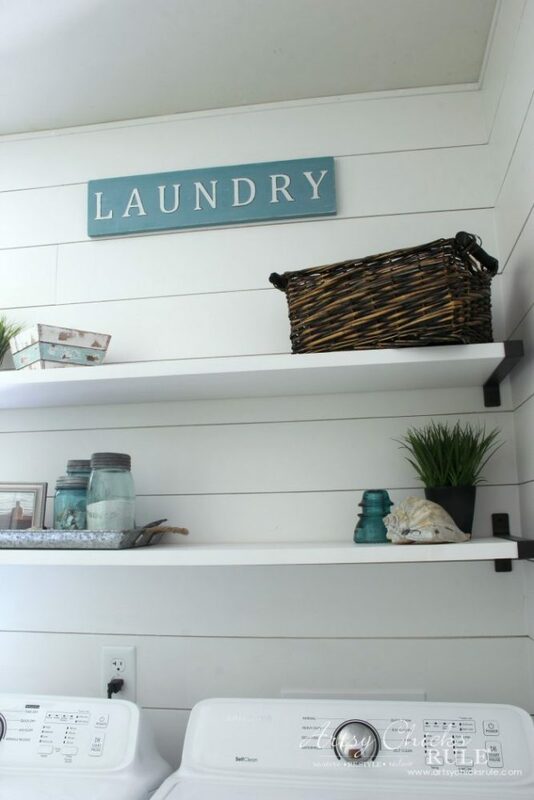 I love what you did with the laundry room. What a difference you made with the room when comparing it to the before pic. 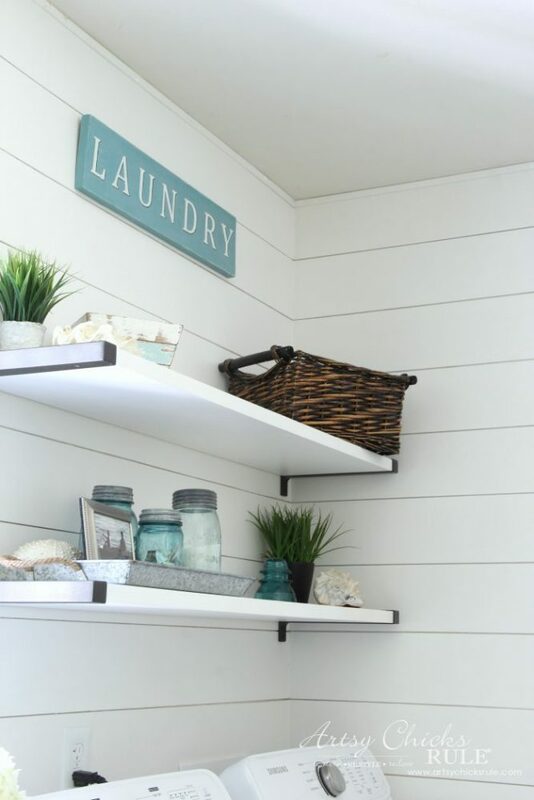 Your laundry room looks terrific! I’d love to do shiplap in a bedroom. 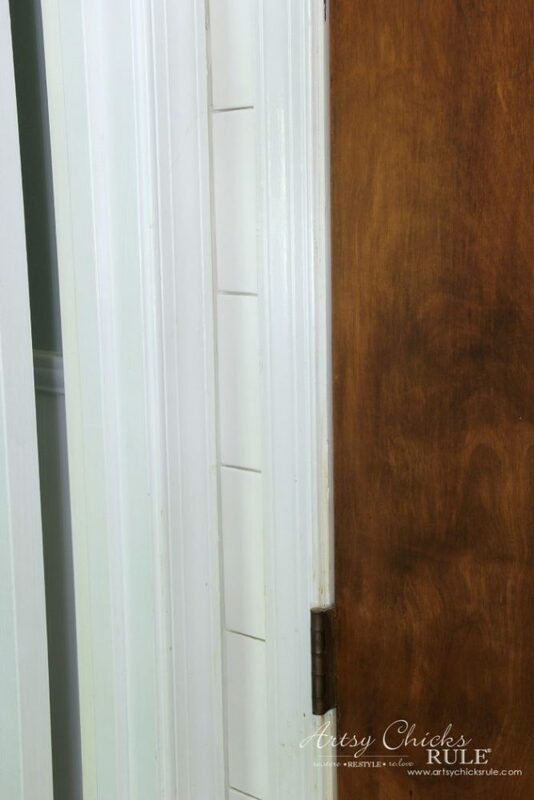 Thank you for the shiplap tutorial and tips! 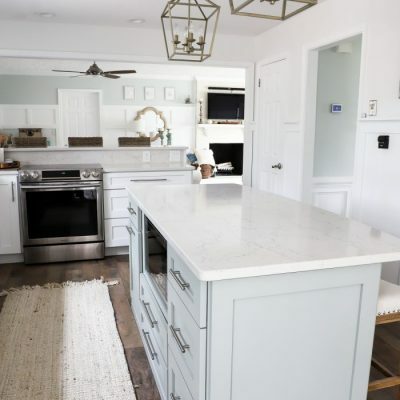 Were the boards all cut to the same length on the long wall above the cabinets? I ask because there are no vertical “seams” visible where the boards meet. Hope I’m making sense,? Yes, it makes perfect sense! That’s kinda how I thought it was done. Really appreciate such a quick and easy to understand reply. Thank you. Love the finished room! It inspires me to tackle my laundry room. 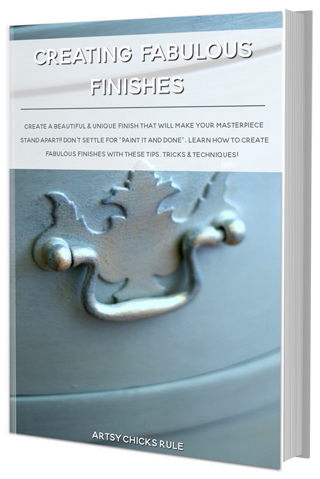 What type of paint did you use: flat, semigloss, eggshell? Looks awesome! I want to do this for my husband in our laundry room. Actually, there are any issues with not using glue? I’m concerned about warping/bowing between where the boards are nailed in. warping/bowing, then I’ll do without. 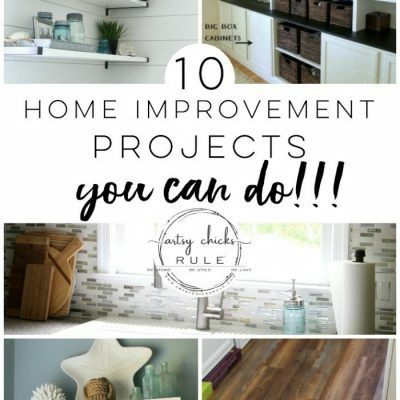 I love your room and we are coming along with ours too….could you tell me if your purchased your shelf with the rod, or did you make it? 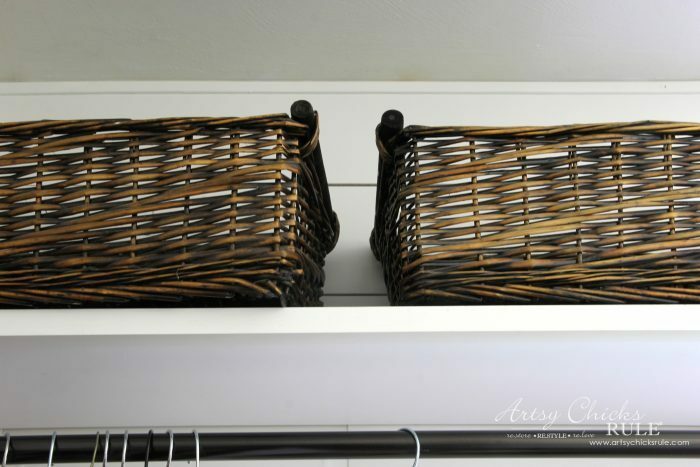 If you made it, could you share how…I just love it, and it’s so practical for hanging clothes on as they come out of the dryer. 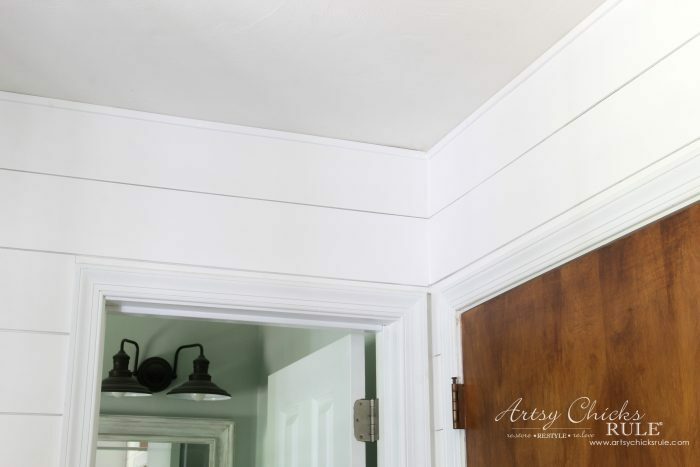 Thanks for sharing how you did the faux shiplap! 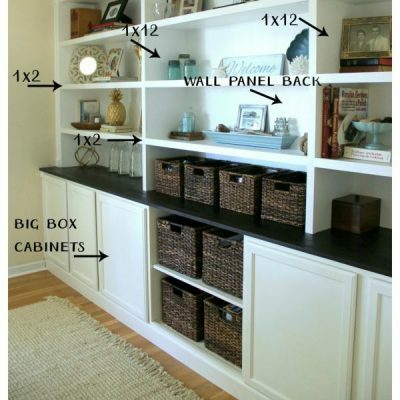 I would love to do this in my home. Also, where did you find that light fixture? Love it! Beautifully done… I’m envious! 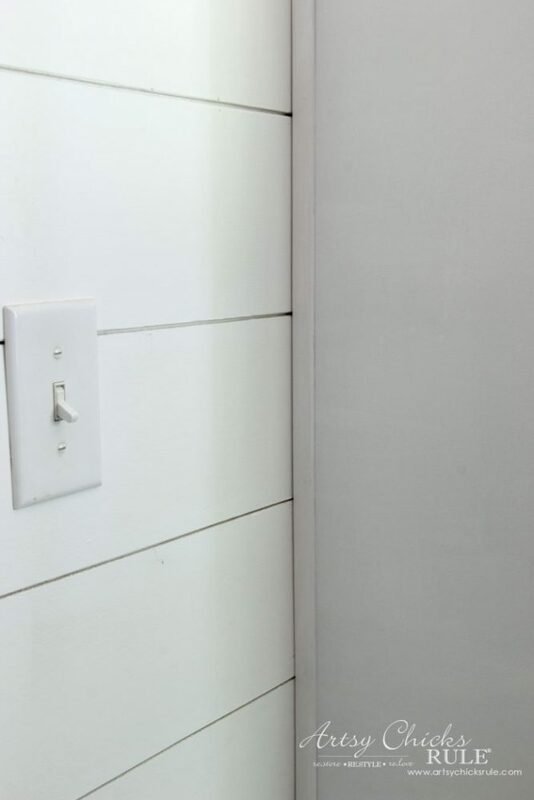 Is the Nano white the same color on your baseboard and door casings? 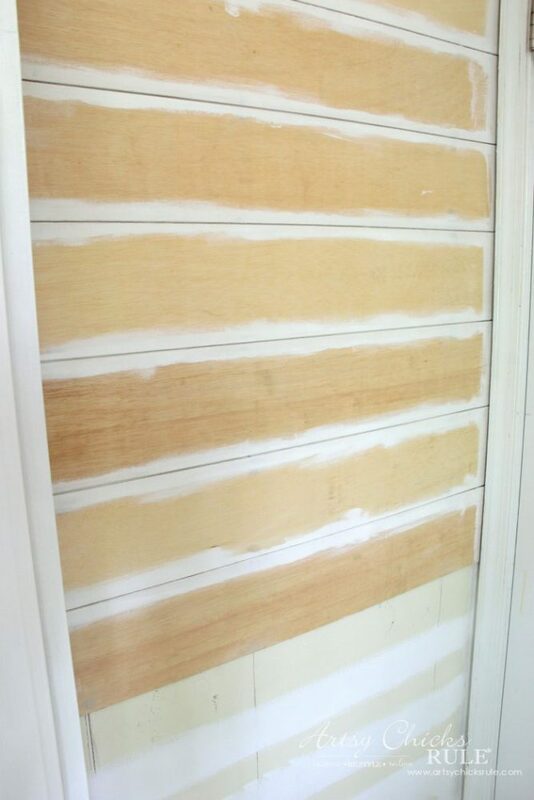 Did you use wall paint or furniture paint for the plywood? Has it lasted well?